Happy Healthy Vegan Friday! My co-host Kimmy is happily giving thanks in sunny California, while I am attempting to stay warm in chilly Atlanta, Georgia. My friend, Chelsie, and I spent today cooking pumpkin cheesecake, pumpkin pie, gravy, biscuits, mac-n-cheese, and green bean casserole. Tomorrow, we’ll be making tofurkey, stuffing, mashed potatoes, cranberry sauce, and brussel sprouts for dinner. We’ll probably be eating all weekend long. Oink oink. I looove pot pie! I know it’s weird, but my dad never bought us frozen foods because he was a hippy and bought organic, all-natural, fresh foods, but when I would stay the night at friend’s houses, I got to taste frozen foods and I liked them! I haven’t made pot pie in awhile because I feel like it’s a winter food, but I’m so ready to embrace winter and start eating this more often. I made this recently for breakfast because I had some apples that had become…let’s say…less than crisp. This is a perfect solution if you have the same problem. If I made these, I would have to multiply the recipe by 8 because I’m a huge piggie and I always want allll the pancakes! Everyone is outside sitting by the campfire (and hopefully telling stories), so I’m going to skidaddle on out there and see what these Atlantaians do for fun. 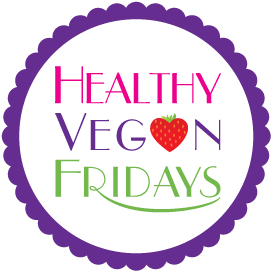 Please use the link below to submit your vegan blog post to Healthy Vegan Fridays!